Is there Crying at Star Wars? 2 weeks ago, we talked about Star Wars movie preparedness. The movie premiers tomorrow, and I wanted to mention one last thing: You’ll probably need tissues! The Hubby was working really late, and I had already turned in. Around 2 am, I was forcefully awakend by loud thumps, red flashing lights and my bed shaking. As you can imagine, being woken up like that was terrifying… a lot of really horrible scenarios involving breaking of doors, kidnapped children, robbers (or worse) and police flashed through my mind. GUESS WHAT!!???!!! GUESS WHAT!!! GUESS WHAAAAAAT!!!!!! Turns out “Darth Maul” (aka the Hubby) was doing a celebratory lightsaber dance around our house at 2 am. Dancing, double lightsaber in hand, he had even jumped up on our bed – where he was now standing, shouting, still wielding the lightsaber using his best Kendo moves. My loving, handsome, responsible, and accomplished Hubby, was giddy as a child. As adults we don’t often let out our unbridled joy like that. We think we are supposed to act like, well, adults. But in that moment, his inner 9 year old fan-boy came out entirely uncensored. And it was a joy to see! (at least once I had calmed down from the initial terror). As you all remember, this was fresh after the spectacular The Avengers movie and a wildly entertaining Star Trek re-boot. And the thought of Disney AND J.J. Arbams AND Lawrence Kasdan (who is of course the writer of one of the greatest movies ever made – The Empire Strikes Back) working together, held such an unimaginable amount of promise, that we ended up staying awake and talking about it into the wee hours. 3 years later, judging from all the attention the movie is getting, I KNOW that my hubby is far, far away from the only one who is beside himself with excitement. Take me for example, when I watched the trailer and heard Han tell Chewie “we are home” there were both chills going up my spine, and a few tears of joy rolling down my cheek. So I know at least one grown woman who is going to bring her Star Wars tissues just in case, with the hopes that the rest of the movie is just as powerful as the trailer. Ed S. at Nerdy Arts made and sold the wonderful Stormtrooper Tissue Cover (used as our cover shot) at Etsy. You know you want one!!! Check his Etsy store out for other geeky-cool items. 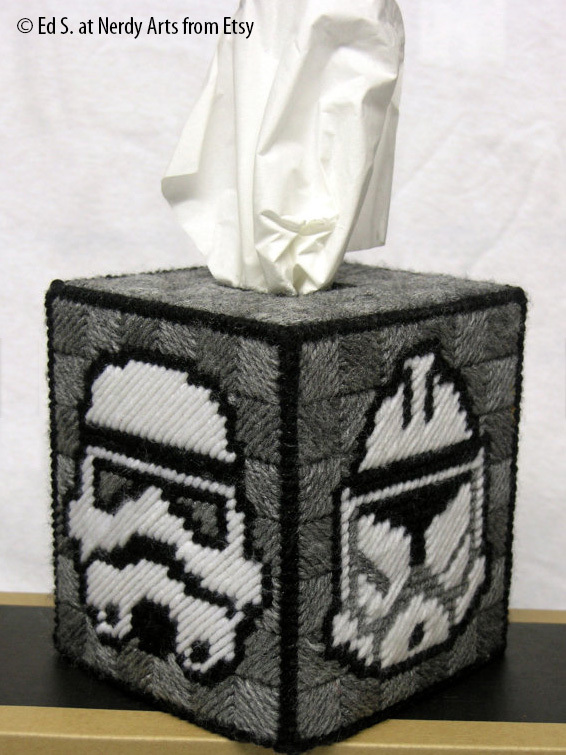 If you want to make your own tissue box cover, you can use any 4 of our pixels patterns for the side designs. I think that would work really well. And this Japanese R2-D2 is my favorite cover I think. BUT unfortunately, I can’t find it for sale, so the link here is just for the source of the image.